Gumdrop DropTech Case for Dell 11'' Chromebook 5190 2-in-1Gumdrop's DropTech Dell Chromebook 5190 Case is a shock-resistant combination of thick silicone bumper skin and rigid polycarbonate casing for Dell's new 2-in-1 tech. This unique DropTech case features transparent panels on the top and bottom of the case, allowing you to personalize and identify protected Chromebook and Latitude models by asset tag, school logo, photos and more! 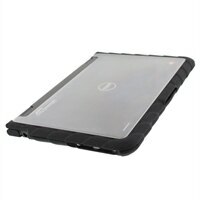 Gumdrop's DropTech Dell Chromebook 5190 Case is a shock-resistant combination of thick silicone bumper skin and rigid polycarbonate casing for Dell's new 2-in-1 tech. This unique DropTech case features transparent panels on the top and bottom of the case, allowing you to personalize and identify protected Chromebook and Latitude models by asset tag, school logo, photos and more!